The final Shootout round for the 2015 Season to decide who took the silver roof was, as with the previous two years, held at the Owlerton Stadium in Sheffield, on 1st November. A fair amount of inclement weather (heavy rain!) had occurred during the week but Steve must have been onto the weather gods as the day turned out to be a clear sky event – and surprisingly warm for November, with the track in near mint condition. 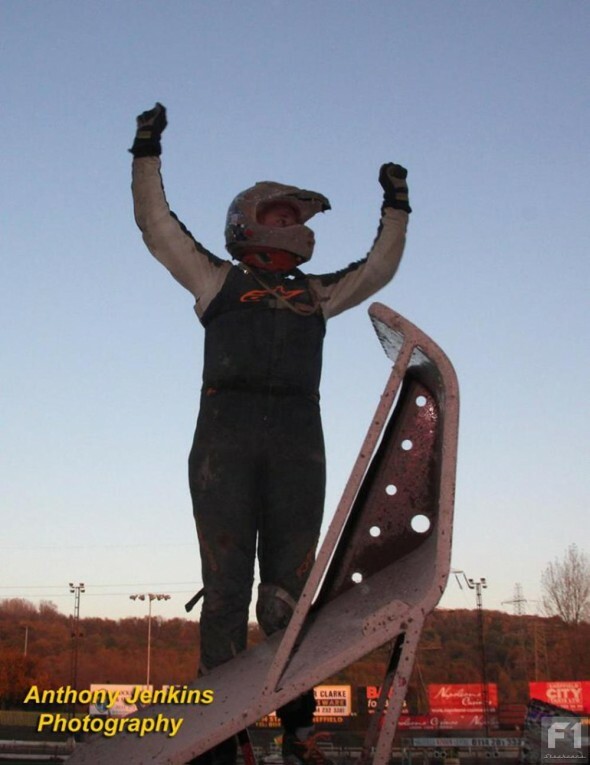 As is the norm with nearly all the Shootout finale’s held, it was another case of there being several drivers who could come out on top. 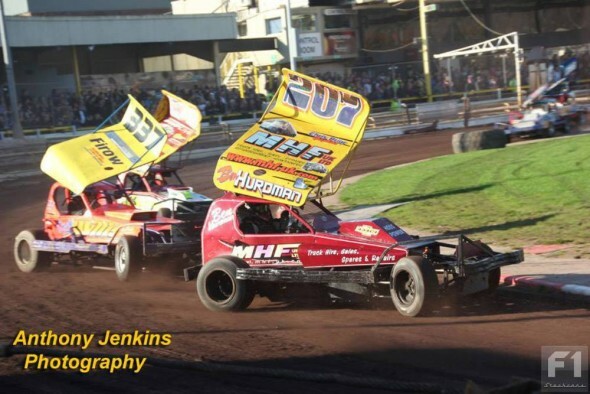 The series may not be to everyone’s taste, but it certainly livens up the season after the World Final and from the sport’s points of view “gets the punters through the gates”. The Sheffield Stadium was the busiest I’ve ever seen in my years of going so BriSCA must be doing something right! Theoretically any of eight drivers could have come out on top after the King’s Lynn meeting the previous week, with Lee Fairhust, Rob Speak and Dan Johnson the top 3 (with 2 points between them) followed by Danny Wainman, Stuart Smith, Frankie Wainman, Paul Harrison and then Mat Newson. 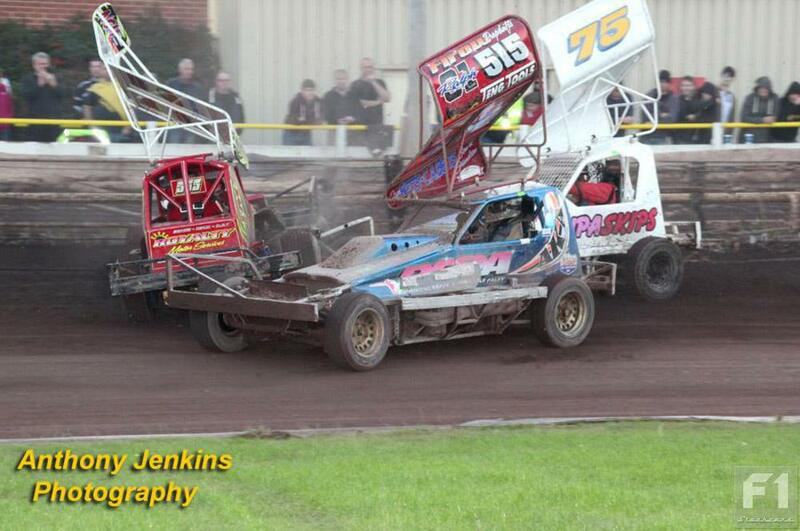 Newson was 43 points behind Fairhurst, but with double points up for grabs, it could have been anyone’s title. A warm and sunny Shootout Finale. The ‘hopefuls’ list was reduced mid-week to 7 drivers, as the 390 driver was on a 10 day stand down after his altercation with Rob Speak at the King’s Lynn plate fence the week before. It was cruel luck for the Rochdale driver who had been down to only one engine for the Shootout. All the hard work for the team in engine swapping was lost, but unfortunately rules are rules. Stuart was clearly disappointed, as those who follow him on the social media sites could see. 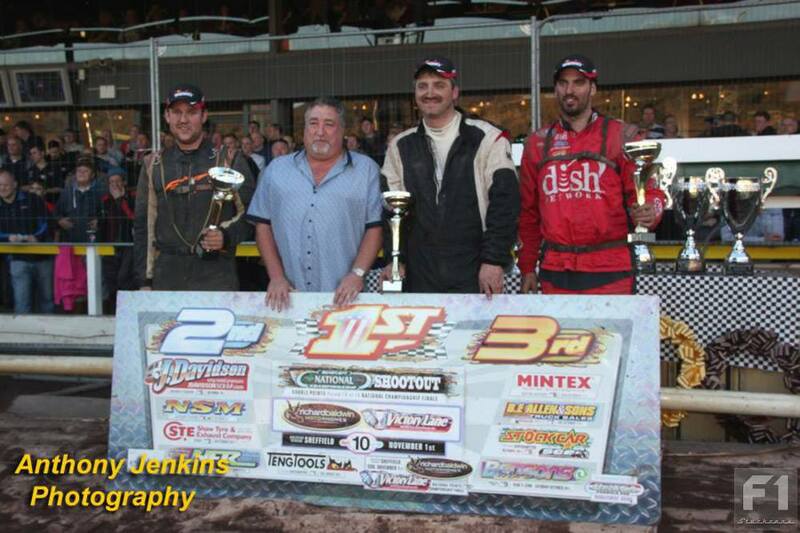 Only 8 of the original Shootout drives were there; Tom Harris, Craig Finnikin and Luke Davidson not attending. The additional driver was Mick Sworder, who could not win as he was too far behind on points. 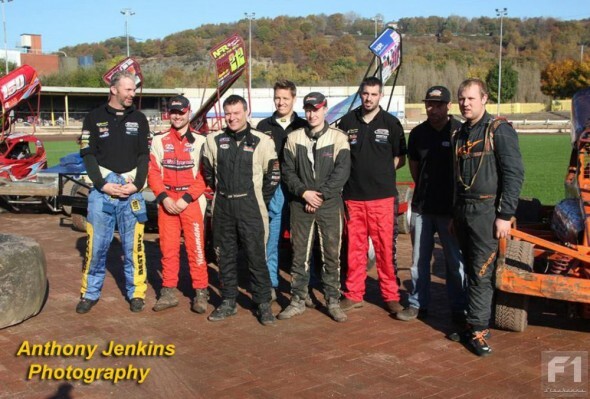 The 8 Shootout drivers in attendance at Sheffield. 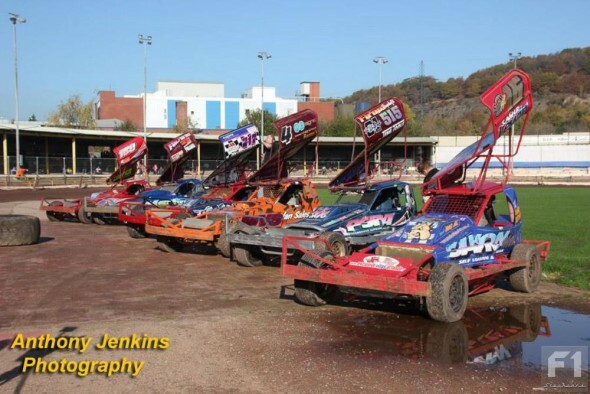 The meeting was to be 2 Heats, Consolation, Final and Grand National, with 34 cars in attendance. The shootout drivers drew lots prior to the start to decide who went in which heat. Heat 1 had 16 cars running on a dry and fast track, which at Sheffield, means the star men really have to work hard from the back of the pack. 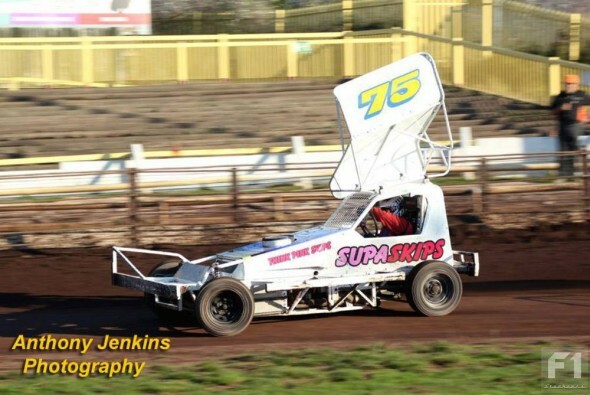 An early spinner was 75 Thomas Stephenson, hitting the back straight fence hard but managing to then get going. 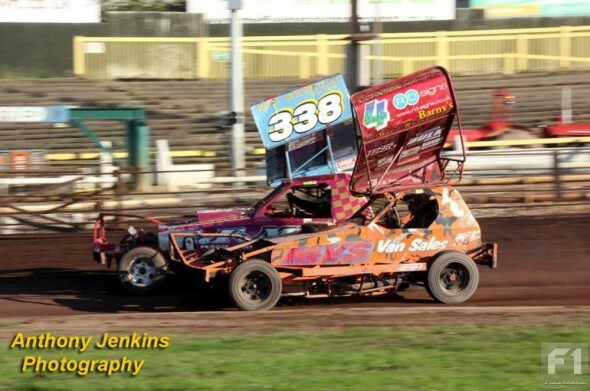 Local driver P J Lemons in the 444 car had hit the front followed by Russell Cooper, whilst highest of the star men was Rob Speak who was on a charge, barging up the insides of the cars in front. The following shooters appeared to be taking a more cautious approach. Dave Willis spun on the back straight ending up backwards in the turn 3 fence and staying there for the remainder of the race. 422 Ben Riley had an argument with one of the tyres; putting it into the turn 3/4 bends and Joff Gibson hammered the pit gate fence but managed to get going again. 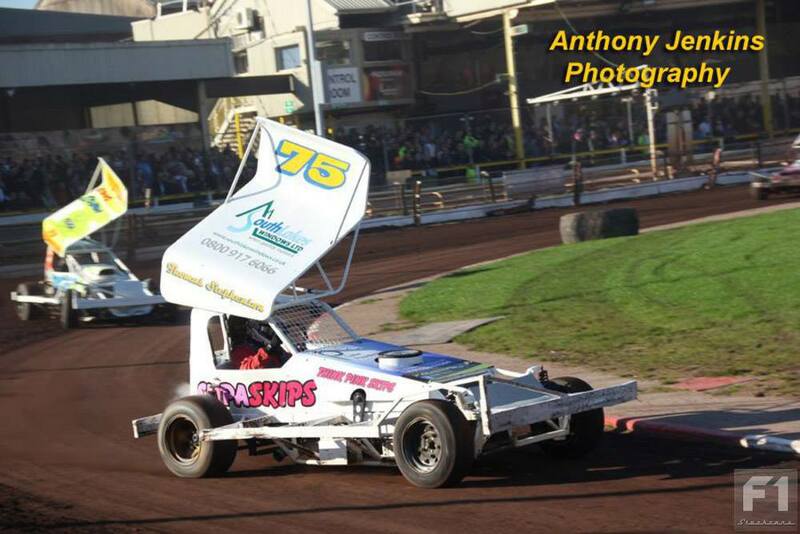 Paul Harrison retired with 5 laps to go with rear axle damage but otherwise it was a flag to flag victory for the local driver P J Lemons, with Cooper taking second. 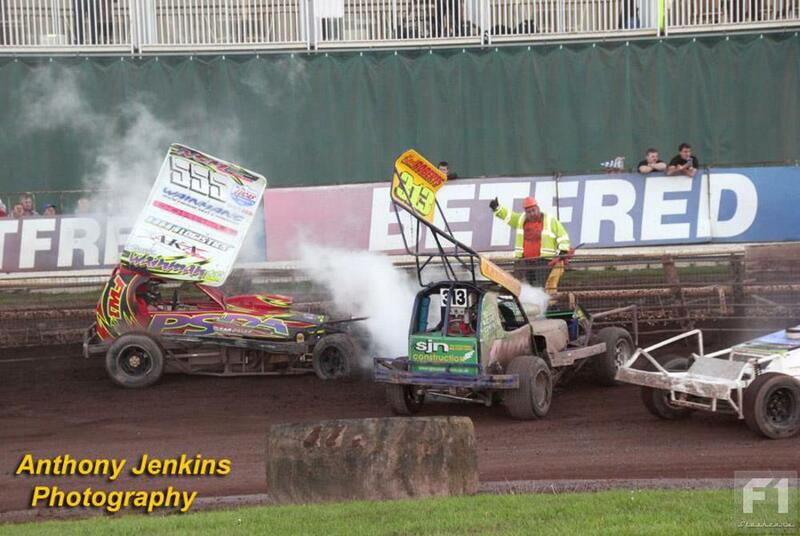 Heat 2 had a slightly bigger grid of 18 cars and was very different. 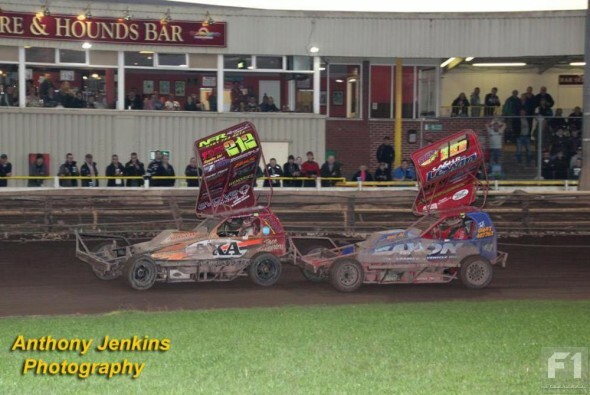 The track being watered led to a slow and slippery first few laps, with the cars appearing to crawl round compared to the first heat. Early leader was the car of 555 Frankie JJ, his first outing on shale and, in typical Wainman fashion, showing little fear for the fast track with wire and rope to snag you. 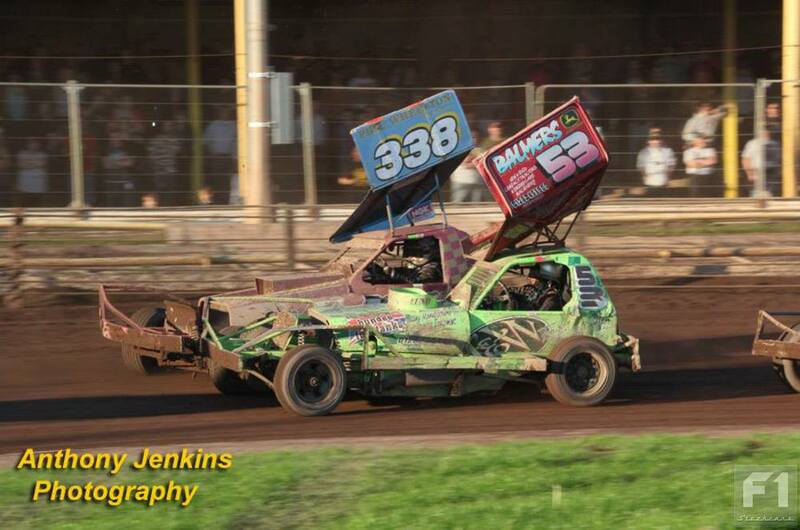 Further back, all eyes were on the star men, Frankie Wainman Junior (515) pushed the 53 Lund car aside, but this allowed Dan Johnson through. 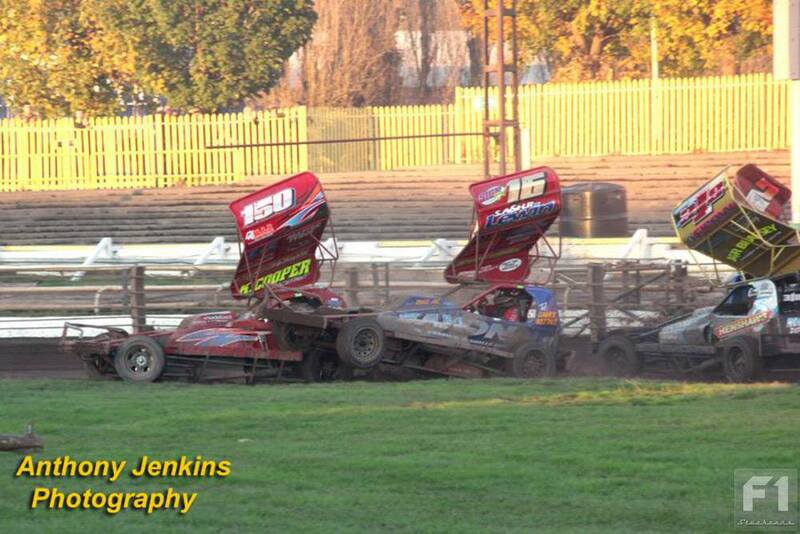 A few laps later the Johnson car was delayed by 34 Mal Brown, letting Wainman through. Two laps later, Frankie pushed the 34 car of Brown aside on the turn 4 bend with Johnson following through behind the 515 car but then soon getting past 515. With 4 laps to go, Johnson (with Frankie close behind) nerfed the backmarking 338 car to go up the inside but as is the risk with these moves, the front outside tyre gave way with 4 laps to go, letting Frankie (515) through for the lead and dropping down quickly but staying racing to the end. 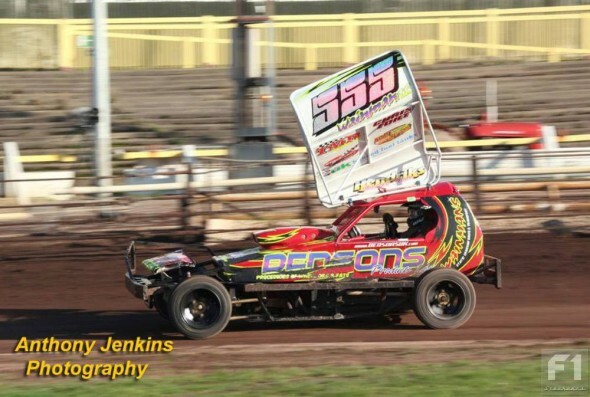 The race was a great points haul win for the 515 pilot but also for Matt Newson finishing in second. 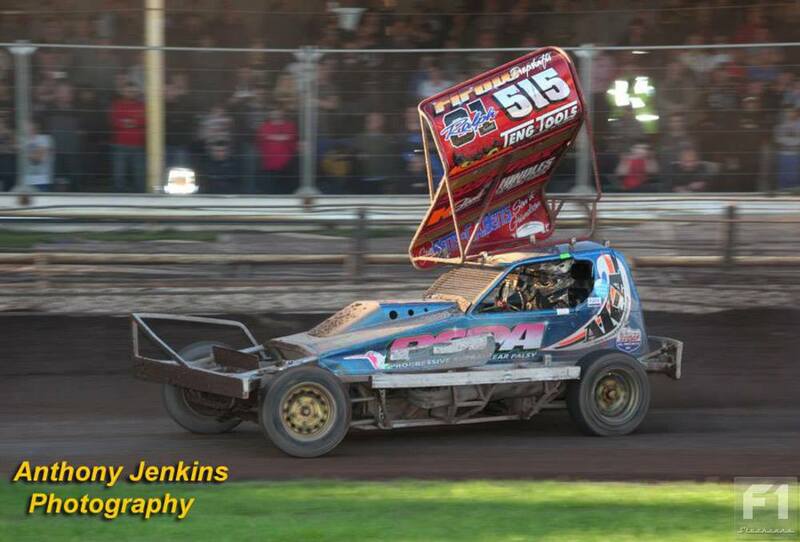 Frankie JJ (555) had led the race with quite a lead ’till lap 12 when he overcooked it; but this could easily have been a maiden shale outing win. 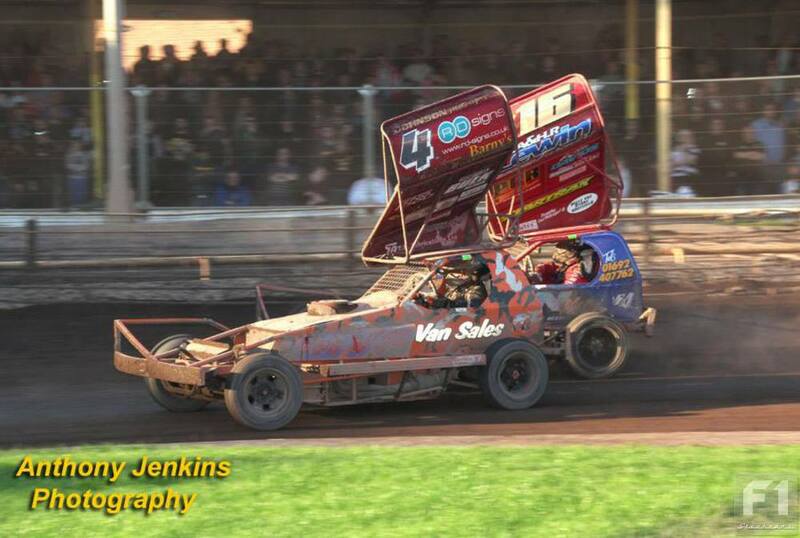 Frankie Wainman Junior Junior was the early leader in Heat 2, but it was his dad who came through to take the victory. The consolation was again watered and led to a slippery start for some. On the back straight 338 Brocksopp, 202 Henry Hunter, 249 Joff Gibson and 421 Jack Aldridge all hooked up big time down the back straight, tangling with the dreaded Sheffield wire. All managed to get going again but it led to an early scare for Dan Johnson, who just managed to miss/barge past but via the slippery infield. From that point on, the Johnson car was on a charge at the halfway point being 4th before getting past Mal Brown and Dave Willis for eventual second spot – although it was anybody’s guess at one point the lead being given for a lap down Thomas Stephenson (75), then correctly for the leading car of 237 Ollie Ives until the chequered eventually was shown to Dave Willis who came home third. 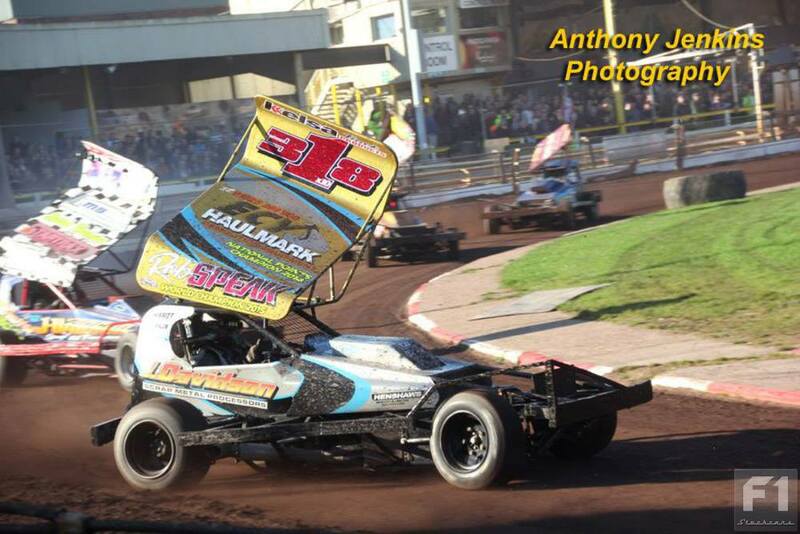 Dan Johnson charging towards the front in the Consolation. With the Final and Grand National to come, Rob Speak was the points leader but between him 217, 4, 212, 515 and 16 was only a 38 point gap. 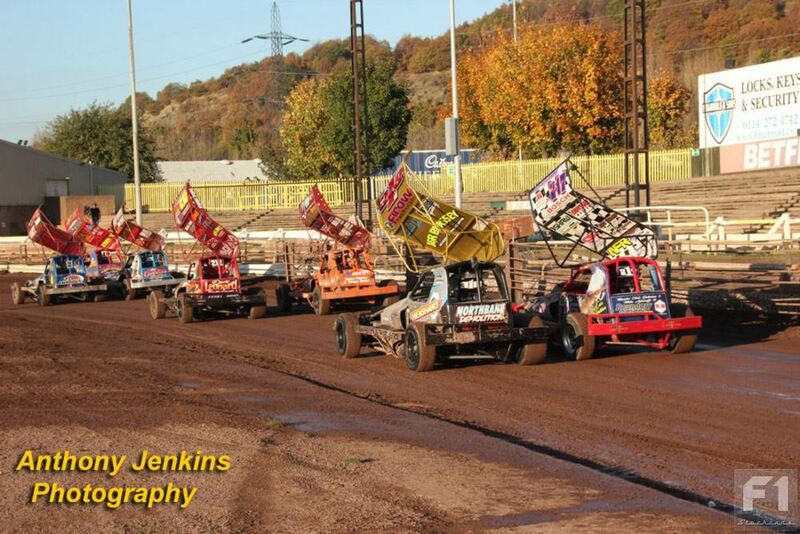 The Final saw 26 cars gridding up. Was everyone going to play safe and finish or go for glory and gun the opposition? 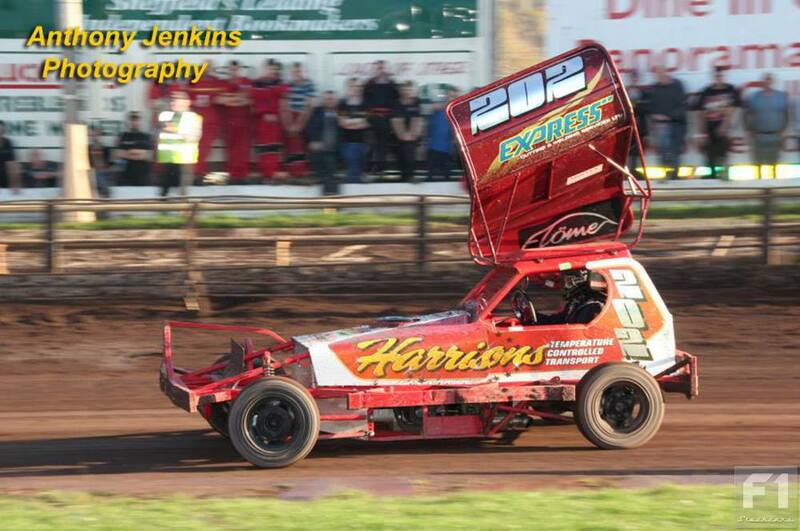 In the early stages Dan Johnson was the biggest mover, nerfing the Danny Wainman aside on turn 3, whilst Lee Fairhurst sideswiped the Rob Speak car the following lap and then the car of Dan Johnson on turn 2. The main man on the move though was Frankie Wainman Junior, who was living up to his post-win comment to Peter York of “I’ll be taking no prisoners in the final”. Things were brought to a halt under yellows on lap 6 with 555 Frankie JJ being spun on the main straight and ending up facing the wrong direction. 422 Ben Riley was also impaled in the fence on turn 3; once the car was removed there was a hasty fence repair by the track team. 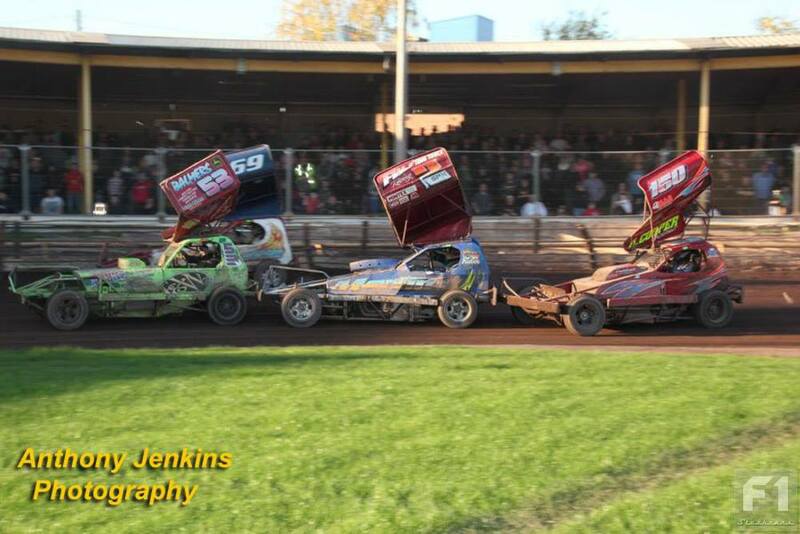 At the restart, 463 James Morris was the lead car but further back the top shooter was 515 followed rather tantalisingly by 16, 217, 318 and then 4. It was Rob Speak who made the first move, half spinning the car of Lee Fairhurst on turns 1/2 but Fairhurst playing it clever decided the best thing was to let the car keep rolling backwards taking both himself and 318 into the fence. 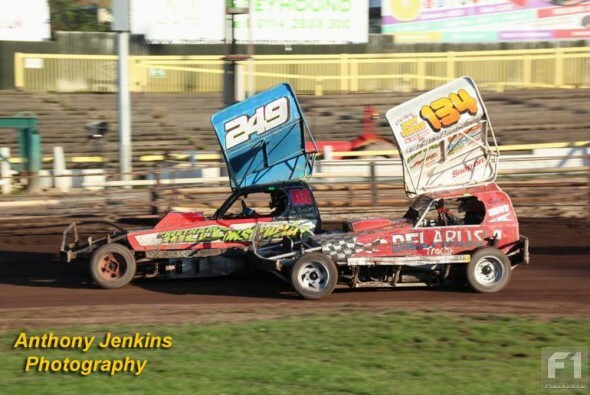 The 4 car was now on a charge in pursuit of the 515 car and soon got past the car of Matt Newson on turn 3 but from near the start the lead car had been 463 James Morris who was unlikely to be caught with 237 Ollie Ives in second. On the final lap, the 515 had got just about close enough to Ives to have a go, when Ives perhaps sensing the outcome kept the power on and drifted wide. 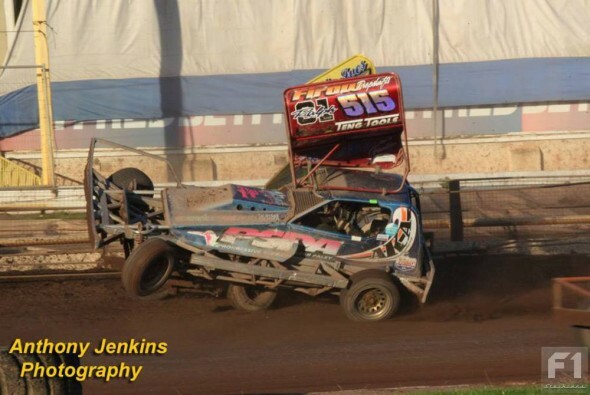 The result was that the 515 car clattered into the 237 car, but either down to luck or years of skill, Frankie kept the power on and drove over the top of the 237 car’s bonnet. 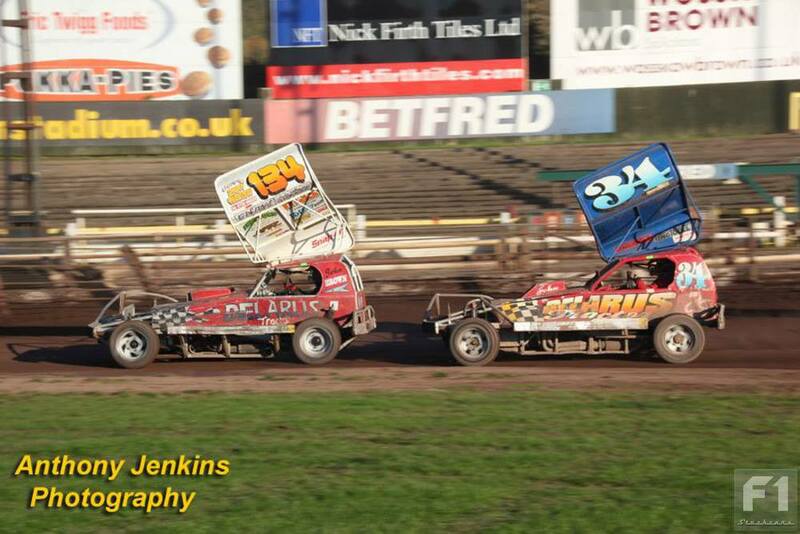 The delay had led to Johnson getting through for second from Newson in third. 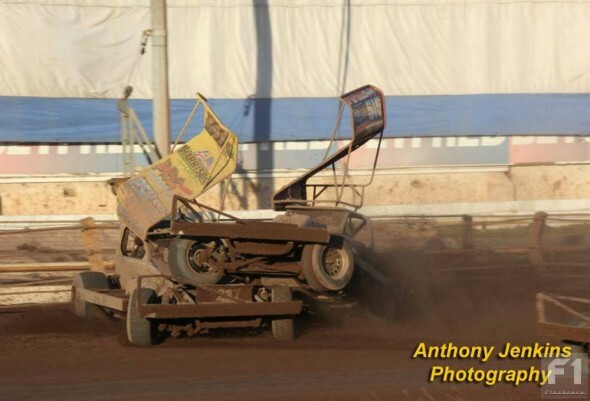 When challenging for second went wrong for FWJ. The Final had led to a situation in the Grand National, where Dan Johnson had a 30- and 32-point lead over the second and third place drivers of Frankie (515) and Danny (212) Wainman; essentially Frankie or Danny needed to win outright and for the 4 car not to finish in the points to alter the Shootout outcome. 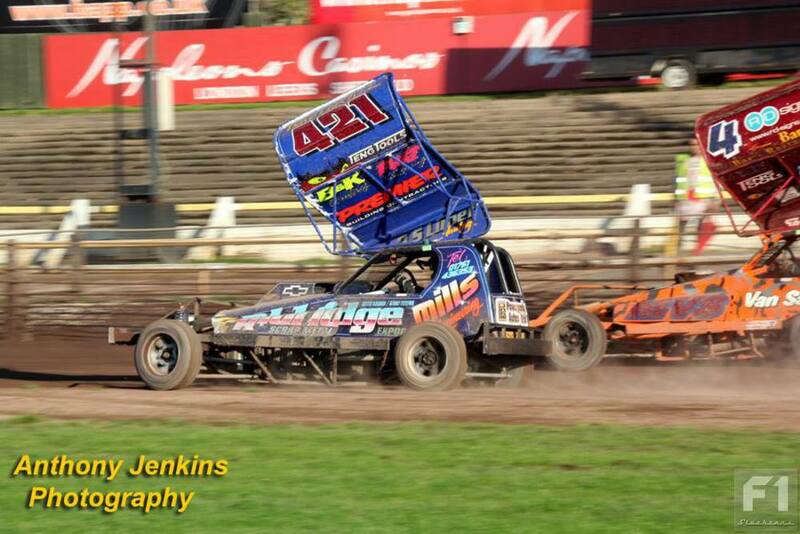 The race was fast and furious but the 4 pilot again kept his cool, managing to get ahead of the cars of 515 and 212. 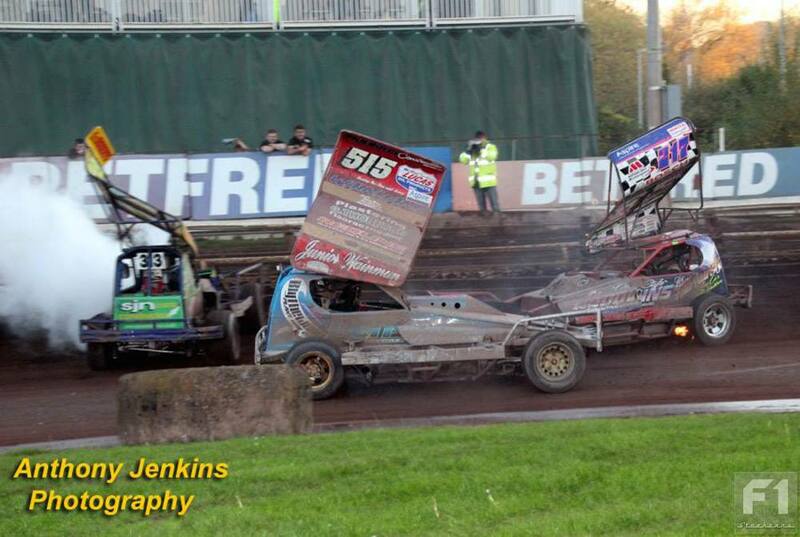 FWJ came to a halt later in the race, spinning out on the coolant dropped by the 313 car on turn 3. 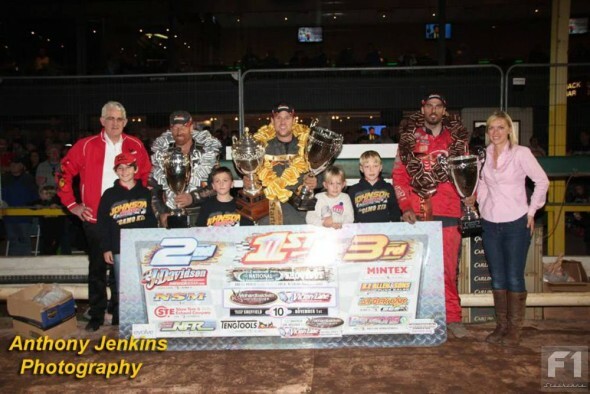 With some impressive donuts being done steering wheel free by the Dan Johnson car at the end, it was again another great finish to the Shootout series, which had yet again gone down to the final meeting – with goodness knows how many permutations of the standings during the meeting. 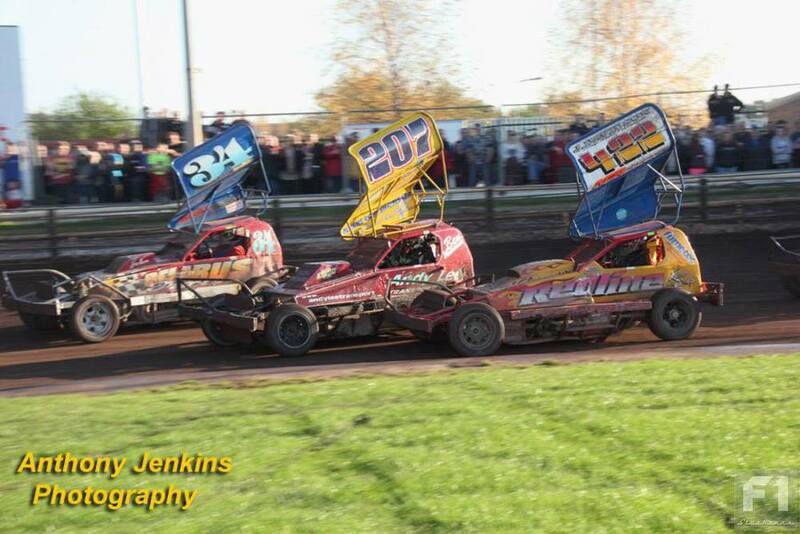 The last twist of fate was a race-off between Matt Newson and Danny Wainman for third spot (Rob Speak confirmed second) as they had both finished on an identical 302 points! You had to be there to appreciate the irony, the race-off being more of a ‘brake-off’ by Matt Newson, but I think the ‘powers that be’ may learn from this tied point situation for future Shootout meetings. An unusual end to the Shootout competition – a ‘race off’ for third place. 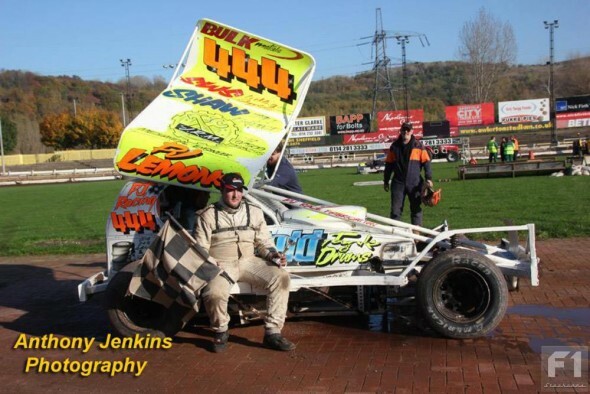 A great result for Dan Johnson who has been so close to many of the major titles for so long and will wear the silver roof proud in 2016. 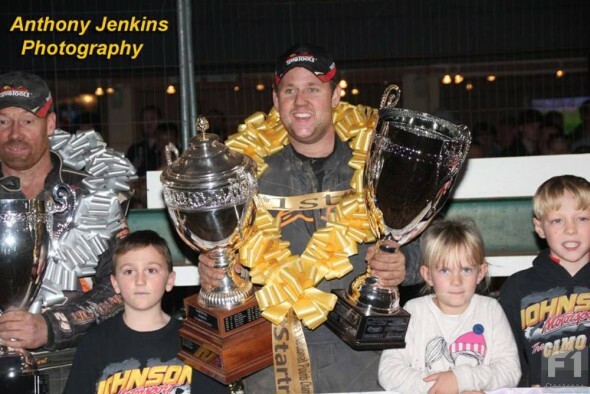 Could Dan Johnson be the man to beat next year? He’s is definitely on pace both on shale and tar.